Sparkbooth DSLR 6 has been updated to support additional Canon and Nikon cameras. Sparkbooth DSLR for Canon now supports EOS 5DS, EOS 5DS R, EOS 7D Mark II, EOS 80D, EOS Kiss M / EOS M50, EOS R, 1D C, EOS-1D Mark III, EOS-1D Mark IV, 1D X, EOS-1D X Mark II, EOS-1Ds Mark III, and PowerShot SX70 HS. New mirror booth mode. 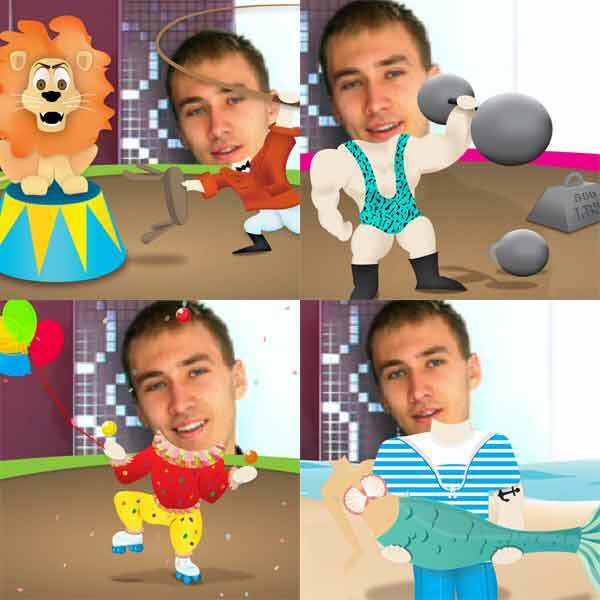 Customize with your own videos. Drawing screen to allow guests to sign or draw on their photos. 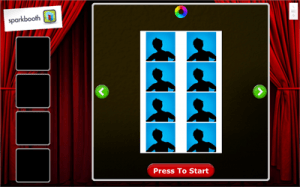 Can be used for photo booth or mirror booth mode. New stickers to allow guests to apply sticker images. 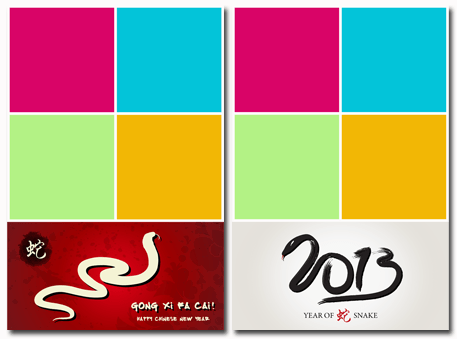 Customize with your own images. New video countdowns. Additional video countdowns. Add additional prints to guests selected print copies from print prompt screen. Useful for ensuring you have a print for a photo book in addition to prints for guests. Licenses purchased after January 15, 2018 already work with Sparkbooth 6 - just use your existing license key to unlock. If you purchase before, you can upgrade your license key at a discount. With latest update, Sparkbooth DSLR 5 now supports the Canon EOS T7i / 800D, 77D, 6D Mark II, and SL2. Sparkbooth DSLR for Canon requires Windows 7 or newer. The latest version of Sparkbooth DSLR no longer supports Windows XP and Vista. If you have Windows XP or Vista, you can use the special version of Sparkbooth DSLR 4 which works for XP and Vista. This special version only supports Canon cameras up to T6i. If you have a newer Canon camera model, you will need to upgrade your operting system to Windows 7 or newer to use the latest Sparkbooth DSLR. To update, start Sparkbooth 5 with an online connection, and you will be prompted to update. 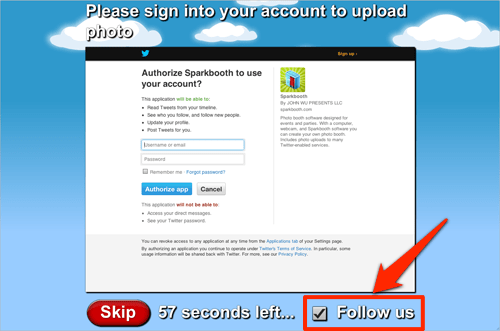 If you have Sparkbooth 4 or below, you can download and upgrade your license to Sparkbooth 5. All licenses purchased after July 1, 2016, will activate and unlock Sparkbooth 5. If you purchased before, you can upgrade your license key. This is a free update for all Sparkbooth 4 users. Please try it out and let me know if you see any issues. [Premium, DSLR] Green screen to dynamically replace backgrounds with your own images. 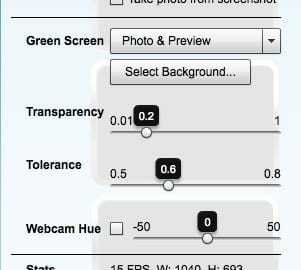 To access this feature, go to Camera settings (press ctrl-3 to display) and enable from the Green Screen drop down list. This feature is only available to Premium and DSLR licenses. Please note, the green screen feature for webcams remains as an experimental beta - it only recommended for DSLR cameras. 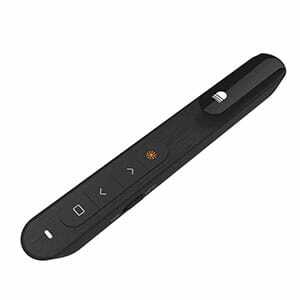 Improved support for using wireless presentation remotes to start sessions, and configurable actions for the next and previous buttons. [Premium, DSLR] Faster Photo Kiosk file cache reloading. If you restart Photo Kiosk, it will start up quicker without having to rebuild the cache. [Premium, DSLR] Add new print prompt options for guest selectable copies. "Display Doubled Copies" is designed for duplicate layouts, so 1 printed copy is shown as 2 copies in print prompt. "Even Numbered Copies Only" is used for printers that prints an strips on 1 sheet and cuts into 2 copies, so this setting can be used to prevent a blank half sheet. Other changes and improvements. See the release notes for details. Sparkbooth 3.8.9 update is now available. 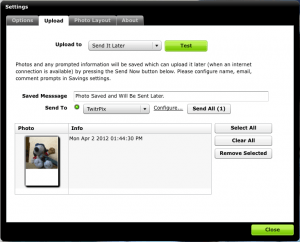 This update allows you always send photos into the Send It Later queue regardless of the selected uploader. So you can select the one of the "Guest" uploaders to allow guests to post photos to their own Facebook or Twitter accounts. Then later after the event, you can upload all the queued photos to your Facebook page or other location. Go to Uploading and select "Guest Upload Chooser", "Guest Facebook", or "Guest Twitter"
Check the option at the bottom of to "Queue into Send It Later"
Now as photos are taken, guests will be given the option to upload to their Facebook or Twitter account, and the photo will be queued in "Send It Later". After the event, you can go to the "Send It Later" upload settings and upload photo to a Facebook page or other upload location. New Baseball theme and layouts for Sparkbooth 3.8. Just in time for baseball season! Just in time for your Oscar Night party this weekend! 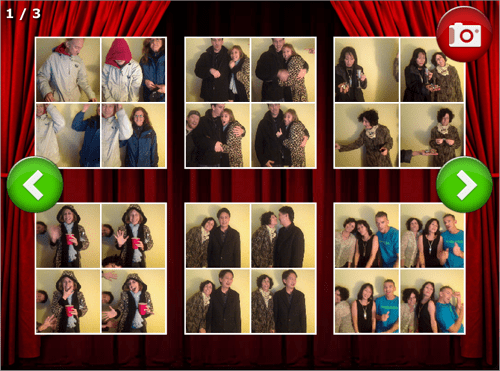 Sparkbooth now includes a Hollywood Award theme and layouts. Optimized several themes to improve CPU usage. If you were experiencing slow downs with some themes, please update. Feb 18, 2013 Update. Additional update to add themed widescreen layouts, fix settings import/export for multi-byte characters, fix rendering of preview layouts after changing photo size, and fix database layout update problem. Announcing Sparkbooth 3.6! 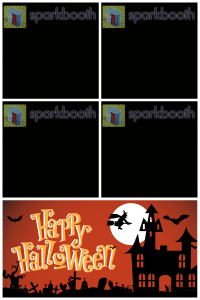 This update works with the Sparkbooth Layout Creator. Sparkbooth Layout Creator is a visual drag and drop editor for creating your own photo layouts / templates. The Layout Creator is free to all Commercial license customers. There are also new features for Consumer license customers, check out the change list below! [Commercial] Guest Facebook upload can display Like dialog for your Facebook Page. 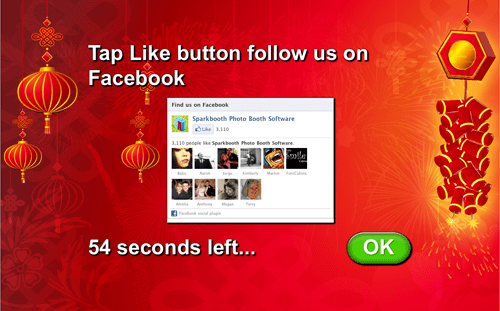 After guests post the photo to their Facebook account, they can "Like" your Facebook Page. Increase fans for your Facebook page! This is a Commercial feature you can enable under Setting > Commercial. Do not forget there is already an automatic Twitter Follow option under Commercial settings! [Commercial] Import Sparkbooth Layout files created using Layout Creator. 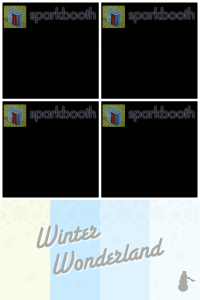 Try out the Sparkbooth Layout Creator now. Other minor fixes and optizations Upgrade to Sparkbooth 3.6 from 3.5 by pressing the update link on the About screen, or press the Download button below. Send It Later is now an email option for the Photo Album. Great for sending emails later if you do not have an internet connection during the event. Import/export settings. Go to Settings > Commercial > scroll download to Import/Export Configurations. Use this to copy your Sparkbooth settings between computers. Note: Does not export save locations, layout backgrounds, layout overlays, camera selection, printer selection, custom voice mp3s. Auto create save subfolders. Go to Settings > Saving > check 'Create new subfolder per day'. Useful for automatically clearing photo album of previous day's photos. 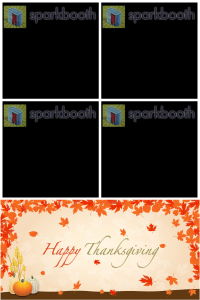 And here are a couple Thanksgiving backgrounds for the square "2 x 2 Top, 4 x 6 Portrait". In Photo Album Kiosk, it displays a notification when the connection to a remote folder is not available. And will recover the connection when the remote folder is available again. New "Home" button on the Photo Album screen to help jump back to the first page with the most recent photos. Today Facebook will be enforcing breaking changes to their authentication process. This affects the Commercial custom Facebook app sign in. Facebook has also started showing a scary the security warning text on their sign in success page. This update fixes the custom Facebook app for these changes, and you will no longer see the security warning. If you have previously setup a custom Facebook app, you will need to add an application domain at http://developer.facebook.com/apps for your app and add a callback url in Sparkbooth. The video tutorial for creating and setting up your custom Facebook app has been updated for this. If you have an existing Facebook app, here are some update instructions. New prompt setting to allow photo to be sent to multiple accounts (by emails, guest Facebook, guest Twitter, or Send It Later prompts). Go to Settings > Prompts > check "Upload photo to another account". This is useful for sending the same photo to multiple guests. Remove delay between count down and photo being taken. Previously there was a half second delay from the end of the count down to photo being taken. Auto enable Show banner when selecting banner image. Add touch/hold lower left corner to toggle lock. Useful for touch screen users! Sparkbooth 3.5 is now available in both Consumer and Commercial editions. 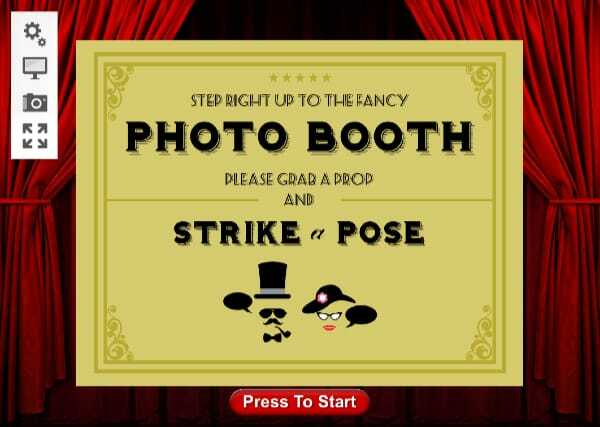 Both deliver an easy and affordable way to set up an instant photo booth at any location or special event. The new Commercial edition includes advanced capabilities for event planners, business professionals and service providers. Sparkbooth 3.5 is available immediately. The Consumer edition is priced at $59, and the Commercial edition at a special introductory price of $100. Free trial versions are available for both. If you have already own a Sparkbooth 3 license, this is a free upgrade. Sparkbooth 3.5 is a separate install, so you will need to activate it with your license key. If you want to upgrade your license key to a Commercial license key, please stay tune - upgrade pricing will be available soon. Clear previous Facebook session for "Guest Facebook" uploader. So the previous guest's email is no longer displayed on the sign in screen. 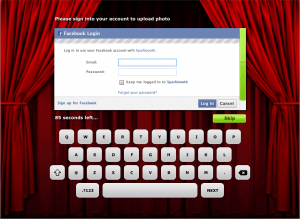 Fix "Malformed access token" error when signing into Facebook. The Sparkbooth 3.4.20 update provides some changes to the Facebook and Guest Facebook uploaders to handle changes to Facebook apps. Facebook provides apps 2 weeks before expiring access. So you will need to re-authenticate your access periodically. The Facebook uploader now shows this expire date. Please update if you use the Facebook uploader. Just a small fix for the print prompt dialog which does not print for some printers like the Canon Selphy. With the new "Send It Later" feature, you can now queue up photos to be uploaded at a later time. This is great if you don't have an internet connection available during your event. Photos and prompted information will be automatically saved. Post-event when you do have access to the internet, you can select an uploader and send all the queued photos. Note: "Send It Later" will work with all the uploaders except for the Guest uploaders. 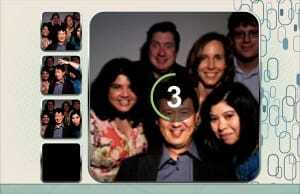 New photo album feature to allow your guests to view, upload, or print previously taken photos. See demo video below. Updated to Adobe AIR 2.7 runtime. Please install the latest Adobe AIR runtime 2.7 or later. Submit emails to MailChimp mailing lists. To turn on this option, go to Settings, select Option tab, select Saving from list and check the "Submit email to MailChimp mailing list" option. You will need to also select the Prompt for email option. SendGrid uploader to email photos to guests. Select this option in Uploaders settings. Postmarkapp.com uploader to email photos to guests. Select this option in Uploaders settings. 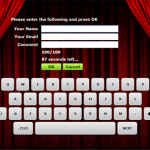 On-screen keyboard used for user prompts. On-screen photo layout selection and layout preview, so your users can now select the layout to use. Only layouts marked as "Favorite" will be displayed. On-screen color button so guests can change video filters. On-screen start button as an alternative to the "Click to start" option. 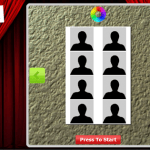 Guest photo layout selection with touch screen or keyboard (ctrl-J or cmd-J). Limit available photo layouts by tagging as "favorite" (heart button) under Photo Layouts tab. On-screen control for guest to select number of print copies. Also works with keyboard (ctrl-P or cmd-P, or minus/plus keys). 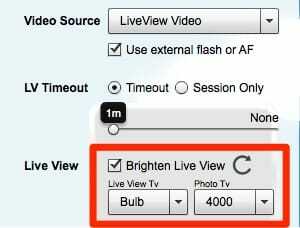 Limit available guest selectable video colors by color button or keyboard (ctrl-K or cmd-K) and option to reset to default color. Enable Facebook fan page albums selection. 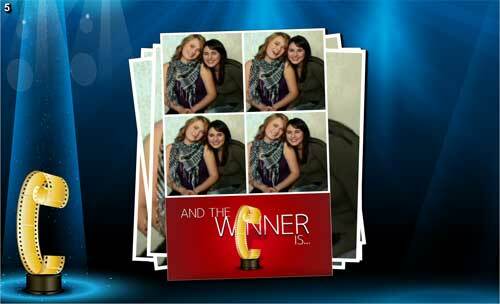 Upload photos to your guest's Facebook account or Twitter stream. If you are running Sparkbooth on a low memory or low powered computer, it is recommended you stay with Sparkbooth 2. Sparkbooth 2 is still available for download on the archive page. If you are a Sparkbooth 2 user and want to upgrade to Sparkbooth 3, you will need to go to the download page to install it. It is a separate install from Sparkbooth 2, so you can have both installed at the same time. Your existing license key will activate Sparkbooth 3. 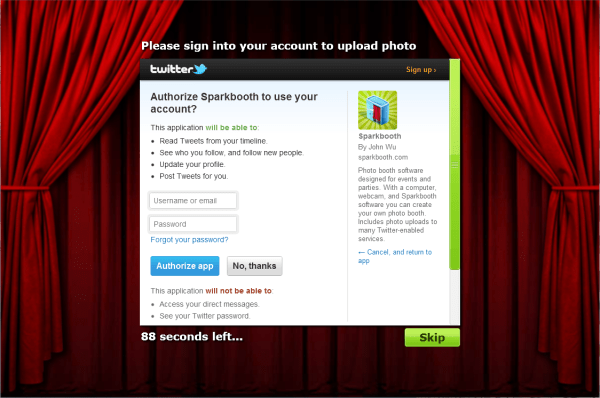 If you are a Sparkbooth Party Edition user, you will need to purchase an upgrade to activate Sparkbooth 3. Please contact me for details, and provide the email address of your Sparkbooth PE license key. 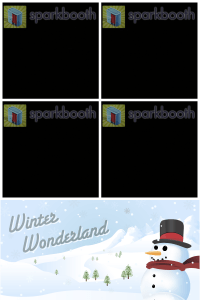 Dec 27, 2011: Sparkbooth 3.0.11d updated to fix incorrect low space warning and display toolbar on start. Fix layout display of wide photo layouts in print and upload preview. Warn of low disk space if save folder drops below 10 MB of free space. Update sequence to save, print, prompt, upload, and then preview. As a result of this simplification, the "Show Preview At" setting has been removed. Added Twitter uploader. You can now post photos directly to your Twitter account using Twitter's offical photo service. Disable fullscreen hotkey (ctrl-F or cmd-F) when Sparkbooth is locked (ctrl-L or cmd-L). Your Sparkbooth license key will also unlock this version. If you have a Sparkbooth Party Edition license key, please contact me about upgrading pricing if you want to unlock Sparkbooth 3. Starting Oct 1, 2011, Facebook is requiring all applications to use OAuth 2.0 for their APIs. If you are using the Facebook uploader, please update to this version in order to continue to upload photos to Facebook. Option to reset video color filter. Go to Settings > Options > Other and check the reset video color setting. Option to change font size of on-screen messages. Go to Settings > On Screen Messages and use the Message Font Size slider. Ability to cancel a photo session using ctrl-Z or cmd-Z. Go to Settings > Options > Other to enable this new feature. Add status indicators to About screen to show if printing and uploader is ready and configured. Add notification if background or overlay image is different size than photo layout. 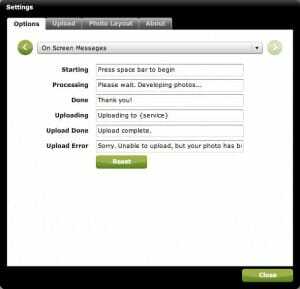 Fix upload complete message for custom uploader. Fix saving of Flicker caption message. Facebook uploader logout button now clears browser session, so login form will be display the next time you need to log into Facebook. Deleting Facebook permissions is no longer needed to change login. Revert back to new Facebook login form now that Facebook has fix their permission page. Photo saving check if file path exists before saving. 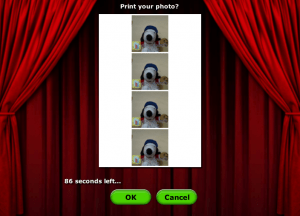 If path does not exist, photo will be saved to default "sparkbooth" folder in Documents folder. Photo color names (Color, Black & White, Sepia, Fotomatic) can now be changed. Select F1 for Settings > select Options tab > select On Screen Messages in list. 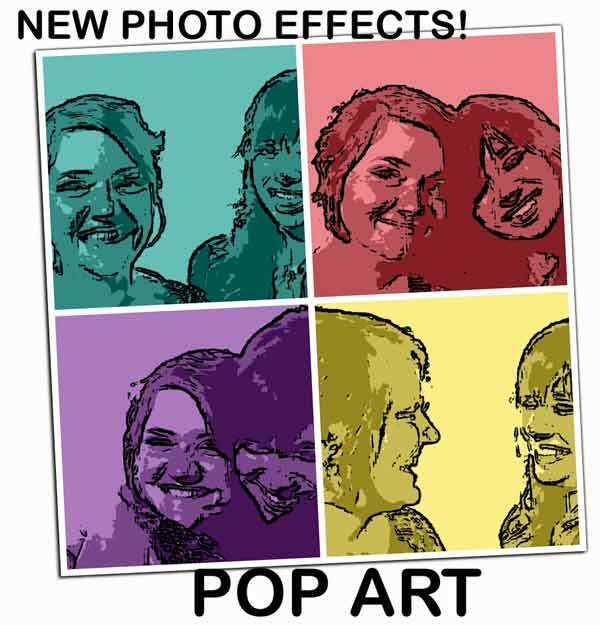 Added "Fomomatic" video filter for plastic toy camera-like photos for your own Lomography photo booth. Add favorite photo layout setting. 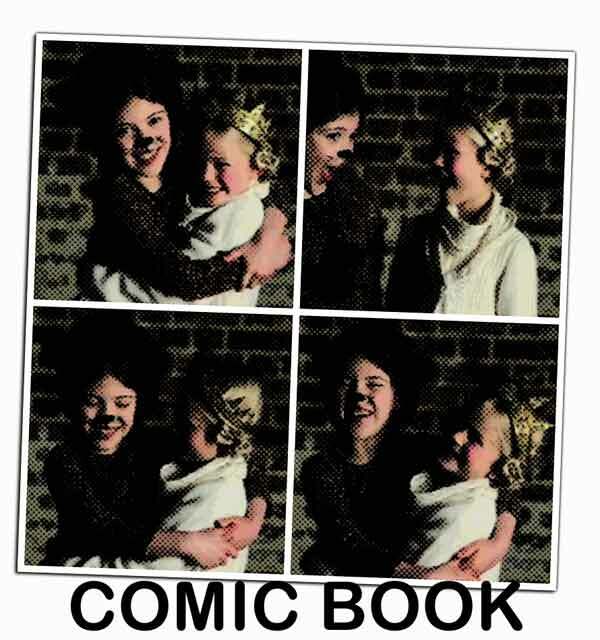 Favorite photo layouts are sorted to top of list. The Test button in the printer settings will now always display the print dialog. This should allow you to setup any printer specific settings that are not available on the regular printer setup dialog. When Sparkbooth starts with printing enabled, you can now setup printing or disable printing. If you choose printer setup, you can also display the print dialog after setup. Photo layout settings control uses less memory. Fix issue where the loading screen hangs on start up if the Flickr uploader is selected. Tumblr uploader now works with accounts with multiple sites. Select the site to post photos by entering the correct tumblr.com url (i.e. yoursite.tumblr.com). Posterous uploader renamed to "Posterous Twitter". Posterous has different upload APIs, the Posterous Twitter upload uses their Twitter authenticated API. Allow negative print margins. This is useful in cases where the actually print area reported is different from actual. For example, if the top of your print is being cut off by 10 pixels. In this case, you will want to enter a top margin of 10px and bottom margin of -10px to push the entire photo down by 10px. Change remaining comment character indicator. Checks if printing is enable on start, and displays printer setup. Added prompt for comment option. Comments will replace photo captions for photo uploads. Prevent exiting fullscreen when displaying settings. Sparkbooth 2.4.x is now known as Sparkbooth PE (Party Edition). Sparkbooth 2.5 and Sparkbooth PE 2.4 are the same product, just different product SKUs. 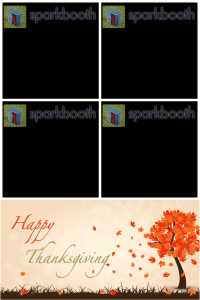 Fixed updating of Sparkbooth 2.5. If you purchased 2.5.x, please update by pressing Download button from here. More changes related to name change. Update the test image and fixed Posterous upload. This release updates the application to its new name. Also includes several uploader changes related to the new name. Please update your installs. Thank you! The application is in the process of being renamed. Please pardon the transition as the website and application are updated. New preview animations. Select from 7 additional previews or set to random. Adjustable preview proof duration. On screen messages will now display non-Latin unicode characters like Chinese, Japanese, and others. Sparkbooth 2.3.4 has been released. The release added a Facebook uploader using the new Facebook Graph API. The old Facebook uploader in Sparkbooth still exists, but will eventually be deprecated and replaced by the Facebook Graph version. Fixes were also made to the Flickr uploader. Sparkbooth 2.3.3 has been released. This is a minor maintenance release to fix hot key issues with reprint, change color, and locking/unlocking. To download this update, please start Sparkbooth and you will be automatically prompted to install the update. Sparkbooth 2.3.1 has been released. This is a minor maintenance release to sort layout list by image size and title. Convert Twitter service uploaders to new OAuth authentication. On August 31th, Twitter turned off basic authentication which is used by all the Twitter upload services in Sparkbooth 2.2, so these upload services stopped working on that date. The conversion to OAuth will allow those upload services to continue to work. New re-print feature. Press control-P or command-P to reprint the last photo during the “Press Spacebar to Begin” screen. New application lock feature. When locked, users cannot quit the application, exit full screen, access settings or camera dialogs. Press control-L or command-L to toggle lock mode. Unlocking can be protected with a password. 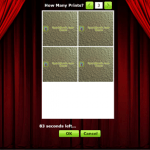 Added 3-photo and 1-photo layouts. 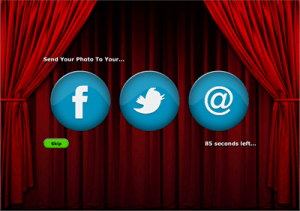 Sparkbooth can now handle less than 4 photo sessions. Added video display-only theme. This is useful if you are using a 1-photo layout. Fixed issue with clicking on “Press Spacebar to Begin” message to start photo session. To update, start Sparkbooth on your computer while connected to the internet and you will be prompted to install the update. Sparkbooth 2.2.1 has been released. This is a maintenance release to add back the “2 x 2 Top, 4 x 6 Portrait” layout. If you are running Sparkbooth 2.3 Beta, you do not need to install this update. Generates upload log. Some photo sharing services may not be reliable, so each photo’s upload status will be logged in the file “partybooth-upload.log” in your Documents folder. You can use this file to manually upload failed photos later. If you have Sparkbooth installed, start the application to get this update. Have a great July 4th weekend! Fixed TwitrPix and TweetPhoto uploads. Sorry about that! Add print margin controls. If your system’s print dialog does not have configurable margins, use these settings instead. If you have a license for Sparkbooth 1, you can update to Sparkbooth 2 for free. Just start-up the application and it will prompt you to update. 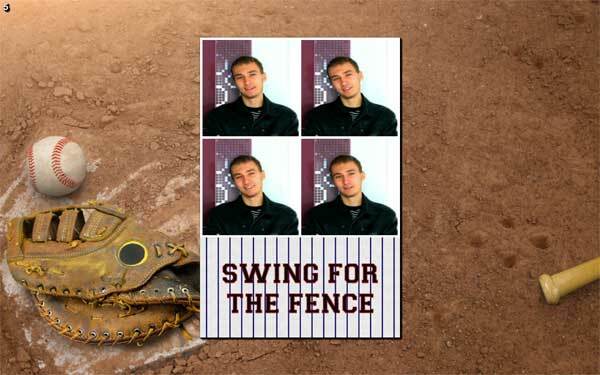 New 2 x 4 photo layout. 1 x 4 photo with duplicate. Great for getting 2 copies in one printing. Option to ask user for name and/or email for “Save to disk only”. Information is saved to delimited text file along with photo filename. Useful for sending photos to guest after the event. This is a free update. To update to this version, just run your existing installation of Sparkbooth, and you will be asked to update. Or download the update by clicking in “Install Now” button on the right-side. If you have purchased Sparkbooth, this is a free update!